The 3rd battalion the Lancashire Fusiliers provided a section for the 144 total strength of the "Malta Mounted Infantry" (Company) together with 3rd Royal Warwickshire Regiment, 2nd Loyal North Lancashire Regiment and 2nd Derbyshire Regiment. This unit later joined the 9th Battalion Mounted Infantry. Capt. (temp. Maj.) Cuthbert Bromley (since drowned). No. 1506 Sjt. Frank Edward Stubbs (since died of wounds). On the 25th April, 1915, headquarters and three companies of the 1st Battalion, Lancashire Fusiliers, in effecting a landing on the Gallipoli Peninsula to the West of Cape Helles, were met by very deadly fire from hidden machine guns, which caused a great number of casualties. The survivors, however, rushed up to and cut the wire entanglements, notwithstanding the terrific fire from the enemy, and after overcoming supreme difficulties, the cliffs were gained and the position maintained. Amongst the many very gallant officers and men engaged in this most hazardous undertaking, Captain Bromley, Serjeant Stubbs, and Corporal Grimshaw have been selected by their comrades as having performed the most signal acts of bravery and devotion to duty. No. 1809 Pte. William Keneally, IstBn., Lan. Fus. Beach 2609 Cpl. John Grimshaw. On the 25th April, 1915, three Companies and the Headquarters of the 1st Battalion Lancashire Fusiliers, in effecting a landing on the Gallipoli Peninsula to the West of Cape Helles, were met by a very deadly fire from hidden machine guns which caused a great number of casualties. The survivors, however, rushed up to and cut the wire entanglements, notwithstanding the terrific fire from the enemy, and, after overcoming supreme difficulties, the cliffs were gained and the position maintained. Amongst the many very gallant Officers and men engaged in this most hazardous undertaking, Captain Willis, Serjeant Richards and Private Keneally have been selected by their comrades as having performed the most signal acts of bravery and devotion to duty. No. 1272 Private John Lynn, 2nd Battalion, The Lancashire Fusiliers. No. 2579 Pte. James Hutchinson, Lan. Fus. For most conspicuous bravery. During an attack on the enemy's position this soldier was the leading man, and, entering their trench, shot two sentries and cleared two of the traverses. After our object had been gained and retirement ordered, Private Hutchinson, on his own initiative, undertook the dangerous task of covering the retirement, and he did this with such gallantry and determination that the wounded were removed into safety. During all this time this gallant soldier was exposed to fierce fire from machine-guns and rifles at close quarters. Capt. (T./Lt.-Col.) Bertram Best-Dunkley, late Lan. Fus. For most conspicuous bravery and devotion to duty when in command of his battalion, the leading waves of which, during an attack, became disorganised by reason of rifle and machine gun fire at close range from positions which were believed to be in our hands. Lt.-Col. Best-Dunkley dashed forward, rallied his leading waves, and personally led them to the assault of these positions, .which, despite heavy losses, were carried. He continued to lead his battalion until all their objectives had been gained. Had it not been for this officer's gallant and determined action it is doubtful if the left of the brigade would have reached its objectives. Later in the day, when our position was threatened, he collected his battalion headquarters, led them to the attack, and beat off the advancing enemy. This gallant officer has since died of wounds. For most conspicuous bravery in attack, when advancing to the first objective, his Company came under machine gun fire from the direction of two " Pill-boxes." Seeing that the galling fire would hold up our advance and prevent our troops keeping up with the barrage, Sjt. Lister dashed ahead of his men and found a machine gun firing from a shell hole in front of the " Pill-box." He shot two of the enemy gunners, and the remainder surrendered to him. He then went on to the " Pill-box " and shouted to the occupants to surrender. They did so with the exception of one man, whom Sjt. Lister shot dead; whereupon about 100 of the enemy emerged from shell holes further to the rear and surrendered. This Non-commissioned Officer's prompt act of courage enabled our line to advance with hardly a check and to keep up with the barrage, the loss of which might have jeopardised the whole course of the local battle. For most conspicuous bravery, self-sacrifice, and exceptional devotion to duty during an hostile attack. At a time when the flank of the division was in danger, Lt. Cassidy was in command of the left company of his battalion, which was in close support. He was given orders prior to the attack that he must hold on to his position to the last. He most nobly carried this out to the letter. The enemy came on in overwhelming numbers and endeavoured to turn the flank. He, however, continually rallied his men under a terrific bombardment. The enemy were several times cleared out of the trench by his personal leadership. His company was eventually surrounded, but Lt. Cassidy still fought on, encouraging and exhorting his men until he was eventually killed. By his most gallant conduct the whole attack was held up at this point and the left flank was undoubtedly saved from what might have been a disaster. T./2nd Lt. John Schofield, late Lancs. Fus. For most conspicuous bravery and devotionto duty in operations. 2nd Lt. Schofield led a party of nine men against a strong point- which was reported strongly held by the enemy, and was attacked by about 100 of the enemy with bombs. He disposed his men so skilfully, and made such good use of rifle and Lewis gun fire, that the enemy took cover in dug-outs. This officer himself then held up and captured a party of twenty. With the help of other parties this position was then cleared of the enemy, who were all killed or captured. He then collected the remainder of his men, made his party up to ten, and proceeded towards the front line, previously informing his Commanding Officer as to the position, and that he was proceeding to retake the front line. He met large numbers of the enemy in a communication trench in front of him and in a drain on his right and left. His party opened rapid rifle fire, and he climbed out on to the parapet under point blank machine-gun fire, and, by his fearless demeanour and bravery, forced the enemy to' surrender. As a result, 123 of the enemy, including several officers, were captured by 2nd Lt. Schofield and his party. This very gallant officer was killed a few minutes later. No. 9860 L./Cpl. Joel Halliwell, Lanc. Fus. (Middleton). 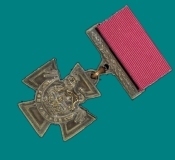 For most conspicuous bravery and determination displayed during the withdrawal of the remnants of the Battalion when closely engaged with the enemy. L./Cpl. Halliwell, having captured a stray enemy horse, rode out under heavy rifle and machine-gun fire and rescued a wounded man from " No Man's Land." He repeated this performance several times, and succeeded in rescuing one officer and nine other ranks. He made another effort to reach a wounded man, but was driven back by the very close advance of the enemy. His conduct was magnificent throughout, and was a splendid and inspiring example to all' who saw Him. Lance-Sergeant Smith while in command of a platoon, personally took a machine-gun post, rushing the garrison with his rifle and bayonet. The enemy on seeing him coming, scattered to throw hand grenades at him, but heedless of all danger and almost without halting in his rush, this NCO shot at least six of them. Later, seeing another platoon needing assistance, he led his men to them, took command and captured the objective. During an enemy counter-attack the following day he led a section forward and restored a portion of the line. During a strong counter-attack Sergeant Colley's company was holding an advanced position with two platoons in advance and two in support. The forward platoons were ordered to hold on at all costs and Sergeant Colley went, without orders, to help these two platoons. He rallied the men, then formed a defensive flank and held it, although out of the two platoons only three men remained unwounded and the sergeant himself was dangerously wounded and died the same day. It was entirely due to his action that the enemy was prevented from breaking through. No. 51674 Pte. Frank Lester, late 10th Bn.,Lane. Fus. (Irby, nr. Birkenhead). For most conspicuous bravery and self sacrifice during the clearing of the village of Neuvilly on 12th October, 1918, when, with a party of about seven men under an officer, he was the first to enter a house from the back door, and shot two Germans as they attempted to get out by the front door. A minute later a fall of masonry blocked the door by which the party had entered. The only exit into the street was under fire at point-blank range. The street also was swept by the fire of machine guns at close range. Observing that an enemy sniper was causing heavy casualties to a party in a house across the street, Pte. Lester exclaimed, " I'll settle him," and, dashing out into the street, shot the sniper at close quarters, falling mortally wounded at the same instant. This gallant man well knew it was certain death to go into the street, and the party opposite was faced with the alternative of crossing the fire-swept street or staying where it was and being shot one by one. To save their lives he sacrificed his own. When Sergeant Clarke's platoon was held up by heavy machine-gun fire, he rushed forward through a strongly-held ridge, capturing in succession four machine-guns and killing the crews. Later, with the remnants of his platoon he captured three more machine-guns and many prisoners and when his platoon was again held up he successfully led a tank against the enemy guns. Throughout the whole of these operations Sergeant Clarke acted with great bravery and total disregard of personal safety. Lt. (A./Lt.-Col.) James Marshall, M.C., late Ir. Gds. (S.R. ), attd. 16th Bn., Lanc. Fus. For most conspicuous bravery, determination and leadership in the attack on the Sambre-Oise Canal, near Catillon, on the 4th November, 1918, when a partly constructed bridge came under concentrated fire and was broken before the advanced troops of his battalion could cross. Lt.-Col. Marshall at once went forward and Organised parties to repair the bridge. The first party were soon killed or wounded, but by personal example he inspired his command, and volunteers were instantly forthcoming. Under intense fire and with complete disregard of his own safety, he stood on the bank encouraging his men and assisting in the work, and when the bridge was repaired, attempted to rush across at the head of his battalion and was killed while so doing. The passage of the canal was of vital importance, and the gallantry displayed toy all ranks was largely due to the inspiring example set by Lt.-Col. Marshall. War Office, 13th July, 1944. On 16th May, 1944, during an attack on the Gustav Line, an anti-tank obstacle held up some of our tanks, leaving the leading Company of Fusilier Jefferson's Battalion to dig in on the hill without tanks or anti-tank guns. The enemy counter-attacked with infantry and two Mark IV tanks, which opened fire at short range causing a number of casualties, and eliminating one P.I.A.T. group entirely. As the tanks advanced towards the partially dug trenches, Fusilier Jefferson, entirely on his own initiative, seized a P.I.A.T. and running forward alone under heavy fire, took up a position behind a hedge; as he could not see properly, he came into the open, and standing up under a hail of bullets, fired at the leading tank which was now only twenty yards away. It burst into flames and all the crew were killed. Fusilier Jefferson then reloaded the P.I.A.T. and proceeded towards the second tank, which withdrew before he could get within range. By this time our own tanks had arrived and the enemy counter-attack was smashed with heavy casualties. Fusilier Jefferson's gallant act not merely saved the lives of his Company and caused many casualties to the Germans, but also broke up the enemy counter-attack and had a decisive effect on the subsequent operation. His supreme gallantry and disregard of personal risk contributed very largely to the success of the action.